Winter can be very unpredictable in the Mountains. Snow can move in quickly and turn mountain roads hazardous. 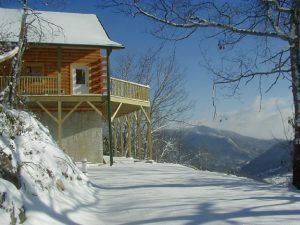 While some of our rentals are in the lower elevations, others are higher up with steeper access. If you plan on coming in the winter it's is highly recommended that you have a 4 wheel drive vehicle and at least one set of cable chains in case of ice/snow on the roads leading to the rental. Please call ahead of your reservation to see what the driving conditions are expected to be during your stay.